Even though it won’t take more than a few lines to describe the standard equipment list, it’s worth going through. 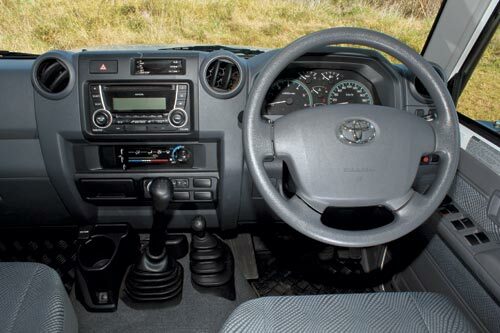 The dual cab entry-level Workmate model features the ABS brakes and front airbags that are in all other models in the range, as well as an air-inlet snorkel mounted on the A pillar, in-dash multi-function clock and audio/CD system with Bluetooth hands-free, audio streaming and voice-recognition phone/audio. The upper-spec – let’s not say luxury – model that we tested, the GXL, adds 16in alloy wheels, wheel arch flares, remote central locking, front and rear differential locks, fog lights, power windows, floor carpet and cloth seats. Only a part-time 4WD system and five-speed manual transmission is available – no auto is offered. 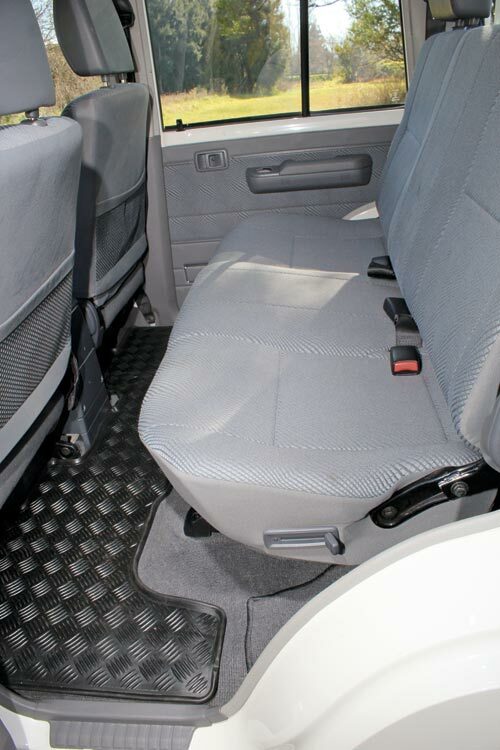 The Dual Cab GXL costs $67,990 plus on-roads. Interior storage isn’t great, with the glovebox, a lidded box in between the seats and a cupholder and card holder next to the gear lever. But at least the centre box is quite deep (once the shallow tray has been removed), so you can store quite a bit of gear. There are door pockets, but they are tiny. The seats are far more comfortable than you first expect, with plenty of side support and under-thigh support. The driver’s view out of the cabin is excellent, with the large side mirrors and minimal side pillar intrusion to the view out. The TDV8 isn’t especially smooth or quiet as far as diesels go but it has a stack of torque available from low revs. 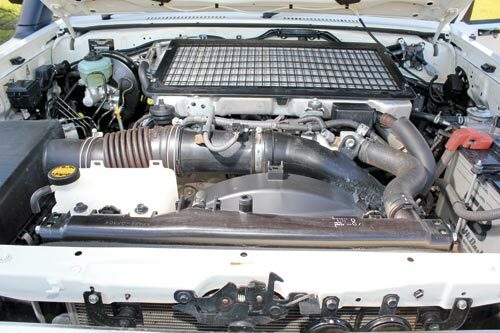 There seems no point letting the tacho flick past 3000rpm though, because the power drop-off is noticeable and the increase in engine noise – especially from the clutch fan – is pretty drastic. Pretend the redline starts at 3000rpm and not 4000rpm as indicated, and the Cruiser gets along well. However, the gearing is very short; by the time you get to 80km/h and you’re in fifth gear, the engine sounds as if you should be selecting sixth gear – only, there isn’t one. So the engine does sound a bit noisy at touring speeds – it’s spinning at about 2400rpm at 100km/h in fifth gear, but its right in the thick of the torque band for hill climbing or overtaking, so there is no need to downshift from fifth on most hills. There is no getting away from the fact that to have a tough, live-axle, coil-spring front and leaf-spring rear suspension setup for carrying loads is not going to work out well for those wanting a lush ride. The Land Cruiser’s suspension appears well tied down but it bounces over lumps and bumps in the road. The same goes for its dynamics – even though it points where you direct it, the Cruiser does have a fair bit of body roll and it isn’t, by any means, the sharpest tool in the shed. Yet anyone who has driven a live-axle 4WD of this type before will know it well, and even if you’re new to this style of vehicle you soon get into a rhythm while driving it through the twisties. The V8 diesel is a bit thirsty for what it is when driving without a load behind it, as it has short gearing and it isn’t very aerodynamic. We averaged 13.2L/100km driving solo. 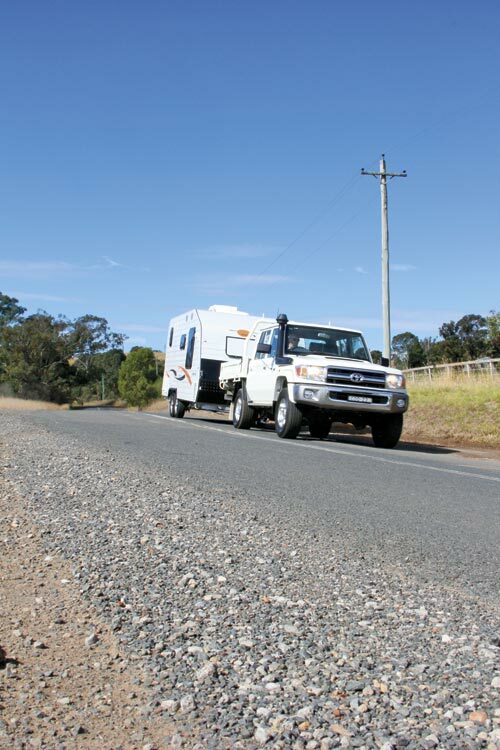 With a 2000kg tandem-axle caravan behind, it averaged 16.4L/100km. There is no doubt the Toyota Land Cruiser was designed to tow large, heavy loads. With its basic, leaf-spring rear suspension bolted to a separate chassis, its chest-thumping V8 turbo-diesel and short gearing, the Cruiser has all it takes to tow very well. With the 2000kg caravan on the back, the Cruiser barely flinched. There was slight sag at the rear with the ball load of around 200kg added, but there was no sway or pitching. 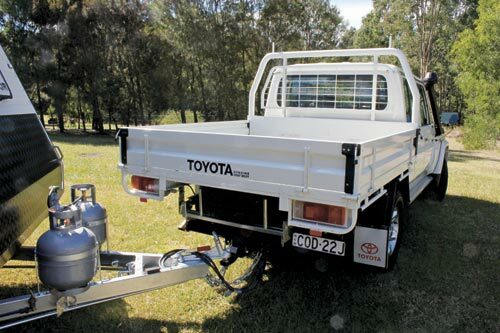 This is a relatively tall and narrow truck, however, so with loads approaching its 3500kg capacity you’d want to set-up a weight distribution hitch for it – in fact Toyota does recommend a WDH for weights towed above 750kg. The side mirrors are really good for towing. Even though the Land Cruiser didn’t seem to notice it had 2000kg tucked in behind in terms of any effects on stability, the truck’s performance was dented a bit by the weight. 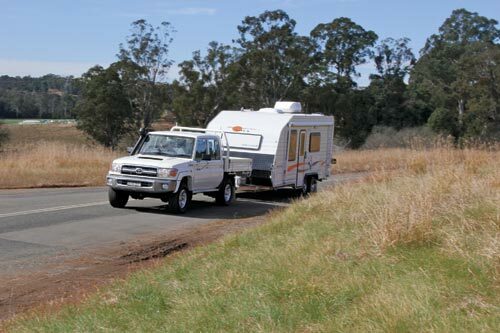 There are more comfortable, more sophisticated 3500kg-capacity tow vehicles out there, but not many that can handle the rough and tumble of outback touring and load carrying as well as the Cruiser can. Its gearing and economy is a bit of a disappointment, but its low-speed torque, rough ground cruising ability and towing stability are all very much its strengths. Adapted from Caravan World #518, September / October 2013.